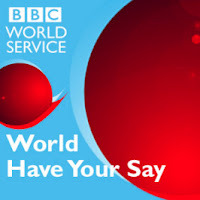 Debating the impact of Capitalism on the BBC's "World Have Your Say"
Without being explicitly anti-capitalist, it's people who have sensed that something is quite wrong. Even those of us who are defenders of the capitalist system - who tend to be more conservative in our political orientation - recognize that something is not right. Cost of living has gone up around the world, including in the UK, the US, other regions in Africa in the Middle East where I consult. So in that sense, it's easy to sympathize with those who are protesting, but the question is: what are they really looking for, and is the movement being led astray into something that's not going to lead to anything better or lead to any improvement and in fact will make things quite worse for the economies in question. I'm sure there is, but it's not going to be a very good system, and it's not going to represent much of an improvement for those who are unhappy with the current system. Capitalism has been responsible for the most growth in people's prosperity, including workers, it's the greatest engine of human prosperity that's existed in human history. So if something's gone wrong, it's not because capitalism has flourished, quite the contrary: it's because pure capitalism has been suppressed by too much regulation, by faulty regulation, by centralization of power, by corporate greed, which has allowed a very small number of people to influence policy, and THAT is what has been detrimental to the working class, to the middle class, to the entrepreneurial class. With the growth of technology, and people able to manage things remotely, there are people who are at the head of companies who are detached from the communities. But if you look at the history of capitalism, if you look at the so-called "Robber Barons" in the United States during the earlier industrial period, those are some of the greatest philanthropists who have existed in our recent history. Those are people who gave back to the communities in which they built their factories, in which they enabled workers. This is the history of Capitalism. This is the way that governments and financial systems manipulate. This is they way that power is concentrated in the hands of governments, banks have too cozy a relationship with those governments, it creates a distortion of monetary policy, it creates massive inflation and THAT is what stops people from having enough purchasing power to lead a decent life. I agree that the system needs reform, that's not in dispute. But the crux of the problem is that Capitalism has been suppressed. And what's happened is that governments have taken too much control they have imposed too much regulation on business, and it's created a society in which people assume that government is responsible to take care of all the ills of society, and is not what Noel and I agree was the case in their capitalist period of the industrial era, in the 19th century when government's role was much more limited, and therefore philanthropy flourished and a concept of charity also flourished in society. Those who benefitted from the workers that they employed and the factories that they built felt a responsibility - and in fact they did have a responsibility to give back to the society; they weren't hoarding money. The point is now people say, "why should I give money to a charity when I'm already being taxed and my money's being sent to places like Ghana, etc." We can go back in time to when I was in grammar school, and we heard about the crisis of sulfurous oxides and nitrous oxides, where are those problems today? They've been eradicated, because the market has dealt with them, and those were real toxins. The idea that CO2 is a toxin on the level of sulfurous oxides or nitrous oxides is ludicrous. my contribution was broadcast live on via satellite from the BBC studios in Beirut in the wake of the "Occupy St. Paul" protesters being forcibly removed from the premises of the London Cathedral. Thanks to my counterpart Noel Douglas for a lively discussion.